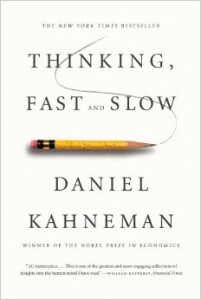 Recently I took a break from the technical literature and read a book by Nobel Prize laureate Daniel Kahneman and I just have to share it. I rarely found so many life truths and own experiences condensed in one publication. The main idea that is presented in the first part of the book is that our thinking is governed by two systems, which the author names System 1 and System 2 for easier narration. System 1 is our intuition, it comes to conclusions almost instantly, e.g. when we walk into a room we instantly see and recognize the people we know. System 2 needs more time and effort; it is by definition lazy and avoids unnecessary effort. Normally System 2 is used for complicated analysis, mathematical calculations and such. The idea presented is that we often take what System 1 gives us for granted because it seems right although after a minute it is obvious that we were wrong. There are also other noteworthy ideas such as regression to the mean which says that after either exceptionally good or exceptionally bad performance comes a change which evens it out.. We all had a feeling that after a very good day something must go wrong – that is not bad omen or prediction but just a rule of nature – we all regress to our personal average. Another notable idea is that we give too much importance to unlikely outcomes, whether positive or negative: “Nothing in life is as important as you think it is when you’re thinking about it”. After all the experiments and examples one thought will surely stick with me: “A drunk monkey throwing darts at a board is more accurate than world class experts who do analysis full time and who have invested years of education and practice in their knowledge” (exact quote: “Analysis of the performance of fund managers over the longer term proves conclusively that you’d do just as well if you entrusted your financial decisions to a monkey throwing darts at a board”). The finding was based on many years’ statistical data in context of world class financial experts who earn their living and bonuses according to successes in previous year but in long term completely random predictions were more accurate. I would recommend this book to anybody who would like to know how our minds work, especially to people involved in decision making because it uncovers some usual fallacies such as anchoring or sunk costs and brings deep insight in functioning of our minds.